In early May, I took a tour of Taliesin West, architect Frank Lloyd Wright’s winter home and architecture school in Scottsdale. Like anyone who has the opportunity to visit, I was in awe of the architecture, beauty and history of the building. During the tour, the guide mentioned that there are only a handful of Wright’s apprentices still living. His youngest apprentice, Vernon Swaback, who worked aside Wright at just 17 years old, is one of them. He’s now in his late 70s and resides in Scottsdale, where he owns his own architecture and planning firm, Swaback Partners. I got in touch with him and asked if he’d be interested talking about his experiences at Taliesin West. He graciously agreed, and before hanging up the phone, he mentioned that years back, he had written an article for Arizona Highways. I searched the archives and found his November 1988 article, Frank Lloyd Wright: A Personal Perspective. In the piece, he wrote eloquently about his experiences with, and observations of, his beloved mentor, a pioneer and innovator who is often named one of the greatest American architects. Today, Swaback’s memories of Wright haven’t faded. When asked his experiences as a student at Taliesin West, Swaback lights up and speaks as if it were just yesterday that he was sitting at the drafting table with Wright. Swaback grew up near Oak Park, Illinois, where Wright also lived for a time. Since high school, he says, he dreamt of one day working with Wright. Having visited and seen many of his buildings in Chicago, Swaback admired his work before he even knew his name. In October 1956, Wright unveiled his rendering of his famous (but never built) Mile High Illinois skyscraper in Chicago. Although Swaback didn’t truly meet Wright at that time, he did get a photo taken with him and the mayor of Chicago. It was during the unveiling that Swaback had the chance to meet some of Wright’s apprentices. He knew he wanted to become one, and he wrote a letter to Wright, hoping to catch the attention of his architecture hero. Just months later, 17-year-old Swaback interviewed to be Wright’s apprentice at Taliesin in Spring Green, Wisconsin. His parents drove him to Wisconsin for his interview, and upon their arrival, they were ushered into Wright’s private studio. At the time, he was studying architecture at the University of Illinois, and when Wright asked him why he wanted to leave the university, he answered the question in a way he never had before. “Because they’re beginning to teach preconceived ideas,” Swaback replied. He says Wright looked at his mother, and then at his father, and simply asked, “Where does he get it? From you … or from you?” Swaback says he knew then that he was in. During his first two and a half years studying at Taliesin West, he worked directly with Wright on a number of projects. He slept in a tent outside and worked outdoors constantly. Swaback says every moment of every day with Wright was a lesson. It wasn’t just lessons in architecture. It was about how fragile beauty is, and about the importance of detail. He also says he appreciated how every apprentice at Taliesin West was treated as an equal, no matter where they came from. In 1959, Swaback says, he and his fellow apprentices were shocked to hear that Wright had passed away at age 91. 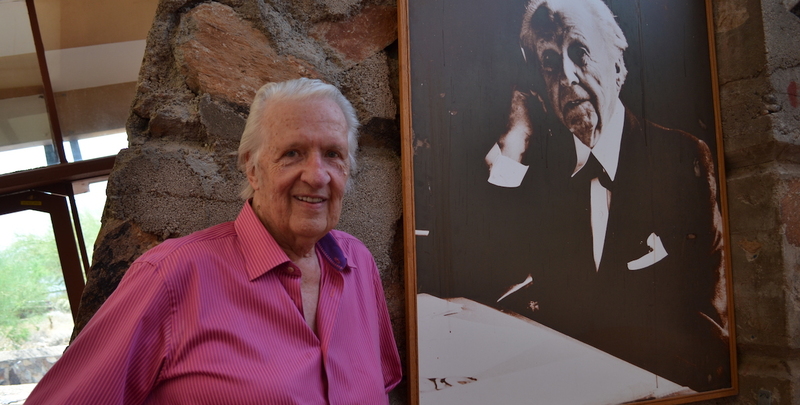 After Wright’s passing, Swaback stayed at Taliesin West for 21 years and eventually became the director of planning there. He left in 1978, at age 38, and started his firm. He’s written several books about Wright and other topics. He says there’s no question that Wright’s work will continue to inspire architects for years to come. However, he hopes to see architecture and the world move in the direction of building communities like the one that existed at Taliesin West back in the 1950s. To learn more about Taliesin West, Frank Lloyd Wright or Vernon Swaback, visit www.franklloydwright.org or www.swaback.com.